Jocelyn, a 21-year old singer/songwriter from Omaha, Nebraska, wants “to touch people’s hearts or make them think or feel something they haven’t felt before.” Taking inspiration from Ed Sheeran and Taylor Swift to Beyonce and Kodaline, you’ll hear these influences in her new single “Speak Up”. 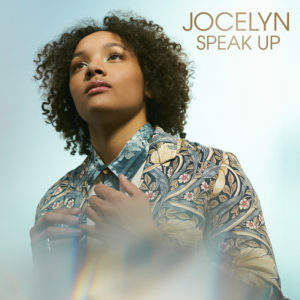 Jocelyn’s single “Speak Up” cover art. This almost 3 minute track is best to listen to when you are relaxing, hanging out with friends, or need some motivation to stand up for yourself in life. “‘Speak Up’ is about turning negativity into positive energy instead of letting the bullies drag you down,” says Jocelyn. “It’s about realizing that you are your own individual, so speak up and live by example.”Jocelyn writes her own music, plays guitar and sings, all while staying focused on positivity for her and her listeners.